Inspired by the Indian philosophy of chakras, this recently renovated Kensington eatery aims to bring balance to body and mind. With inventive yet nutritious cuisine and a smartly-designed and homely space, you’re sure to leave with a full belly and happy heart. Tucked unassumingly behind Kensington High Street on the corner of Drayson Mews, the interiors tastefully bring together old and new. 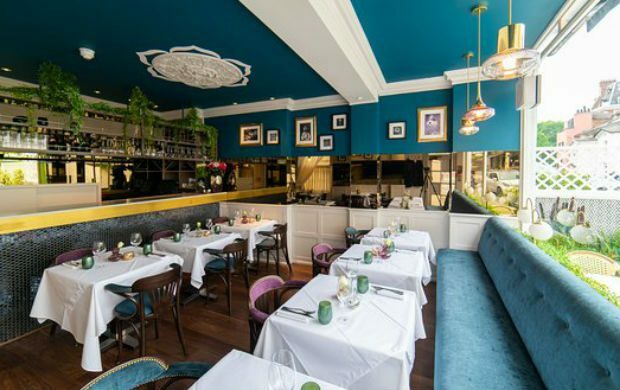 The teal walls with intricate plasterwork are decorated with an array of vintage prints, and the classic white tablecloths are adorned with jewel-toned glassware. The aesthetic sets the tone for the presentation of dishes which were carefully considered throughout. While it’s hard to imagine on a beastly cold January evening, the outdoor terrace – complete with woven bistro seating and lush planting – would make an ideal spot to while away a summer afternoon, rosé in hand. Our Saturday night visit coincided with a large private booking for an 18th birthday. Luckily for us, it didn’t feel too much like crashing a kids’ party considering the majority of the teenagers were sat in the private dining area downstairs. I can imagine on a normal night the restaurant would be buzzing will a mix of well-heeled locals and foodies who’ve made the trip for a treat. A great spot for a date or catch-up with friends, the sharing nature of the menu makes it ideal for large dinner parties, or celebratory evenings. Helmed by a team of chefs trained at India’s finest hotels, the seasonal menu is inspired by North Indian cuisine and offers a creative twist on authentic dishes. We started with poppadoms and chutney, and then moved on to share the Samosa Ghugni Chaat (£7.50) and Punjabi Fish Fingers (£8.95) to start. All were full of flavour, and the delicate mix of spiced yellow peas, mint, yoghurt and pomegranate that accompanied the samosas were a particular highlight that really elevated the street-food inspired dish. We shared a mixture of grill dishes, curries and sides for our main, and were impressed by everything we were served. Favourites included the supremely juicy and lightly spiced Sunhari King Prawns (£15.95), the rich and buttery Dal Makhani (£8.50), and the decadent Chilli Cheese Naan (£4.45). We were stuffed by dessert but couldn’t say no to the Valrhona Chocolate Mousse (£6.95) and Mango Kulfi (£5.95), a decision we didn’t regret. Both dishes were light and delicious, even if we felt like we needed to be rolled home by the end. The cocktail list predominantly offers classics with a nod to India in a couple of choices (the Chakra Spice, a tequila-based long-drink with raspberry and chilli, certainly looked tempting). We kicked off with Peach Bellinis (£8) and were so impressed we quickly ordered another round. While we did not sample the wine list on this occasion, the selection was extensive and carefully considered to suit all tastes and budgets. Innovative modern Indian cuisine, moreish cocktails and a laid-back atmosphere all make Chakra ideal for long, languorous dinners.